U.S. banks are well capitalized, but they remain challenged by weak interest income, said Federal Reserve Chair Janet Yellen in prepared testimony on Wednesday. Discussing the present and future of the embattled hedge fund industry, Tiger Management’s Julian Robertson – one of the most prominent names in the field – said that hedge funds are facing “the most difficult time I’ve ever seen in the business” his investing career (observing that “there are a lot of people squeezing shorts”), and warned that the days of charging hefty fees may be over. Well, Janet Yellen has continued policies in order to keep interest rates artificially low, and she knows it. She has helped create a bubble that will burst. And ultimately, that burst will be worse than what billionaire Julian Robertson seems to believe. At this stage if interest rates are allowed to rise this could impact the economy, and if they rise enough, make it impossible for the US government to pay interest on its debt. The timing of the possible increase in rates in December certainly seems political. Judging by the candidate’s recent comments, a Donald Trump administration would not be hospitable to the current Federal Reserve makeup. Consequently, should the Republican win, it would create pressure on the central bank’s command structure — so much so that Chair Janet Yellen would be inclined to resign, according to one analysis of the increasingly tense situation. The speculation comes amid a fresh round of criticism the outspoken New York businessman has lobbed at the Fed. Is this just another rant from Donald Trump or is there maybe something to this? Janet Yellen had hinted about raising interest rates last December, but as of this instant, still has not done so. She knows that it would be safer in the long-run for the economy to do so (see http://www.nbcnews.com/business/economy/feds-yellen-testifies-economy-strong-enough-handle-rate-hike-n473756)–but some think she wants to wait until such an increase will not hurt Hillary Clinton’s chances of being elected the next President of the United States. In the past several years, it has become clearer that the US Justice Department, as well as its Internal Revenue Service, has taken steps that certainly seem to be motivated by politics. I do not believe that the Federal Reserve is immune from doing so as well. 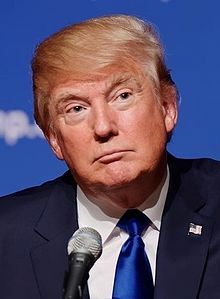 While, publicly the Federal Reserve has not voiced a presidential candidate preference, one would think that with Donald Trump’s occasional anti-Wall Street rhetoric (as well as anti-Fed rhetoric), that they may not want him elected (Hillary Clinton, too, has made anti-Wall Street rhetoric, but her history of financial ties to Wall Street have made many consider that she is much more likely to support Wall Street views than Donald Trump). Several actions that the US Federal Reserve has taken during the time of the Obama Administration have been biblically inappropriate (Isaiah 1:22; Habakkuk 2:6) and will contribute to the end of the USA (Habakkuk 2:2-8). This entry was posted on Wednesday, September 28th, 2016 at 2:30 pm	and is filed under Prophecy.